Car Seat Without Flame Retardants – Do They Exist? Looking for a car seat without flame retardants? Flame retardants are thought to possibly cause health problems – especially exposure to young children. So why are there flame retardants in car seats? HealthyStuff.org has released a new study on toxic chemicals in children’s car seats. The sixth study of its kind since 2006, leading environmental scientists at the Ecology Center said that this year’s findings were an improvement from previous years, however there are still toxic chemicals found in car seats. This year’s study focuses particularly on finding a car seat without flame retardants (FRs), which continue to be used despite there being no data showing they provide a fire safety benefit to children. Rather, they put babies and young children in close contact with chemical additives that are known to be carcinogens, hormone disruptors and developmental toxicants. Babies are the most vulnerable population in terms of exposure to chemical-laden dust from products like car seats, since their systems are still developing. Three different analytical techniques were used to find a car seat without flame retardants: X-ray fluorescence, infrared spectroscopy, and gas chromatography with mass spectrometry. A database with full results from the 2016 tested seats, as well as previous years, is available at www.HealthyStuff.org. –First-ever flame retardant-free car seat coming soon — In 2017, for the first time, a car seat marketed as free of FRs will be on the market produced by UPPAbaby. The “Henry”, a new infant car seat in their “Mesa” line, leaves out chemical FRs in favor of a wool blend to meet regulations. The FR-free Henry will be available in the spring of 2017. 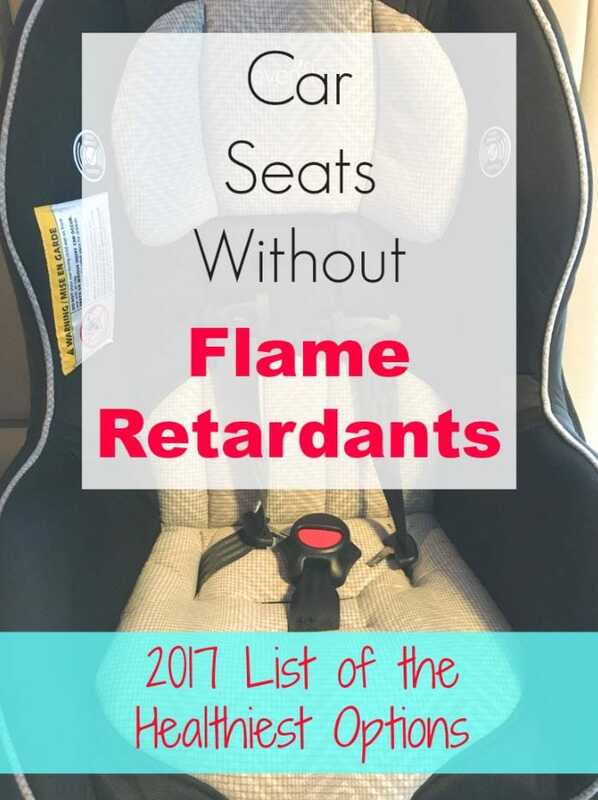 –Flame retardants are still widespread — Aside from the UPPAbaby seat, FRs were found in all of the car seats that were tested, and for the first time were found to be in widespread use in the fabrics of car seats. –Most car seats still contain brominated flame retardants (BFRs) — This is concerning, as brominated chemicals are typically persistent, bioaccumulative, and often toxic. –Alternatives to BFRs have not been tested for toxicity — Manufacturers have stopped using some flame retardants with known hazards, but the health effects of many of the substitutes are unknown. The Ecology Center is encouraging lawmakers to exempt child car seats from the federal flammability standard. Despite 44 years of this U.S. regulation, The National Highway Traffic Safety Administration can provide no evidence suggesting that the rule protects children in vehicle fires. Congressman Jared Huffman (D-San Rafael, California) introduced related federal legislation (HR 5359) in May, which is pending. The new report reminds parents that car seats are critical safety devices and that parents should ALWAYS properly install and use a car seat for babies and children regardless of its chemical composition. What year was the Pria 70 that you tested manufactured in? Thanks! Hi Christine, We didn’t do the actual test. We referenced the test that was done by a third party to find the results. 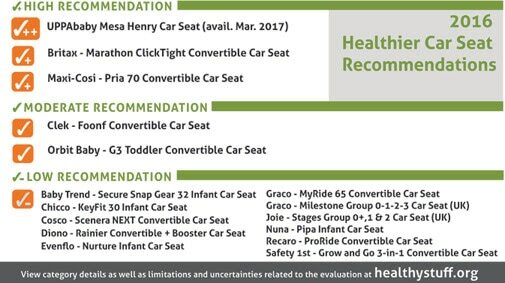 Were there any infant car seats on the recommended list beside uppababy? I actuallypre-ordered the Mesa Henry for this baby that’s due in a couple of weeks, and got word that they are delaying shipment until summer. So that clearly is not going to work out and I’m scrambling! Thanks for the post. I’m an environmental chemist that studies some of these chemicals in the environment, so I’m aware of the problems. But one thing no websites seem to talk about are the chemicals used to make some of the fabrics stain resistant. These are typically per fluorinated compounds. While I haven’t been able to find the specific per fluorinated compounds used, many are problematic, but we are just now learning about them. If you haven’t heard about them, search PFOA, PFOS and lawsuit. Jeremy, Yes, the stain resistant fabric is so heavy with chemicals! I asked for a new couch not to have stain repellant coating put on it and the salesman looked at me like I was crazy. Wiping off stains is a nuisance, but I’d rather have fewer chemicals exposed to by avoiding stain repelling finishes.